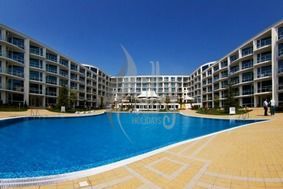 Location: Atlantis Resort & Spa hotel is situated at the Bulgarian Black sea coast in Bourgas city, Sarafovo district, only 200 m from the sandy beach and 1 kilometre away from Bourgas airport. The area is calm and quiet, at the same time not far from the city centre. The complex works year round. It is suitable for leisure and business. Accommodation: The hotel complex offers studios and one-bedroom suites, which are air-conditioned and fully furnished. Each of them features dining area, mini bar, microwave, coffee maker, cable TV, direct telephone line, individual air-conditioning, Internet and fire alarm. Bars and restaurants: Restaurant Loft is the perfect place for business meetings, cocktail parties, birthdays and name days, proms, corporate celebrations, private parties and weddings. The restaurant has a main hall with 65 seats and a banquet hall with 200 seats. Facilities: The complex offers lobby bar, spa center, bowling, children's area with games and 2 conference rooms with full technical equipment. During the summer season at guests disposal are two outdoor swimming pools for adults and children, a poolside bar, which offers a variety of drinks, cocktails and fresh juices. Conference hall: Atlantis Resort & Spa offers excellent conditions for conducting training programs and seminars. The conference rooms of the complex are equipped with screen, flip chart, multimedia projector and lecturer's desk. The halls are equipped with sound system and constant internet access. Depending on the ongoing arrangement, seats can be optionally organized. For coffee pauses and talks there are spacious lobby and a garden with beautiful view.